Provides training and maintenance services. flightworks provides charter services, block charter membership, aircraft management, aviation consulting and government aviation support. an aviation consulting and private jet charter brokerage firm with offices based in dallas, texas and aspen, colorado. complete aircraft sales and acquisition consulting, private jet charter coordination, aircraft appraisal and similar services. aircraft charter brokerage and aviation services company specializes in aircraft lease and charter services. based in dubai, uae. offers consulting services to companies considering aircraft ownership and charter options, and aviation engineering. includes company and aircraft profiles, services, forum and news. located in germany and serving all of europe. provides corporate aviation solutions for european based companies, specialists in consultancy, executive aircraft charter, corporate aircraft management and acquisitions. charter, aerial video, eng, ems in los angeles, san francisco and beyond. provides charter of light through heavy jet, turbo prop and helicopter from 7 locations across the us. providing a complete service from purchase to sale including charter. charter, maintenance, sales, fuel services, refurbishments in latrobe, pa.
offering comprehensive professional air charter services. provides aircraft charter and sales, maintenance, fuel and fbo services from waukegan regional airport (ugn). provides flight schedules, charter services, and online booking/confirmations, based in the usa. bulgarian cargo charter aviation company. information about fleet and capabilities. supplies aircraft for charter anywhere in the world. specialising in executive jet charter. charter, sightseeing, flight training, aerial photography. located in northern virginia. jet charter company available for travel to united states, canada, mexico, caribbean, and central america. offers information on executive and sightseeing charter flights, based out of bozeman airport, montana. corporate aviation management, charter and sales in europe. overview, services and fleet details. Provides both helicopter and airplane flight training, aircraft sales, avionics, maintenance and charter services. provides details on jet charter services, the fleet, flights worldwide and pricing. headquarters in boca raton, florida. Provides flight training, charter and maintenance. Details of youth programs, seminars, newsletter, promotions and courses. provides air cargo and charter service, flight instruction, aircraft rental and maintenance. located in hartselle, alabama. executive aircraft charter, sales and leasing. information on the rates, fleet, management and video on the services. air charter service also offers scenic flights, alpine soaring, flight school, aircraft rentals and maintenance. business jet charter company offering details on the fleet, services, and contacts, based in mississauga, on. executive charter airline company offering details on crafts and services in the eastern caribbean, based in antigua. offers business and private charter aircrafts to european destinations. features online quote request. Offers flight training, rentals, aviation supplies, air charter and maintenance services. Located on Paine Field in Everett. If the business hours of North Star Aviation in may vary on holidays like Valentine’s Day, Washington’s Birthday, St. Patrick’s Day, Easter, Easter eve and Mother’s day. We display standard opening hours and price ranges in our profile site. 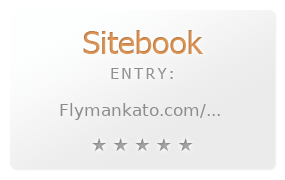 We recommend to check out flymankato.com/ for further information. You can also search for Alternatives for flymankato.com/ on our Review Site Sitebook.org All trademarks are the property of their respective owners. If we should delete this entry, please send us a short E-Mail.